The third story in The Vampire Chronicles, Queen of the Damned, follows three parallel story-lines. The rock star Vampire Lestat prepares for a concert in San Francisco, unaware that hundreds of vampires will be among the fans that night and that they are committed to destroying him for risking exposing them all. The sleep of a group of men and women, vampires and mortals, around the world is disturbed by a mysterious dream of red-haired twins who suffer an unspeakable tragedy. The dreamers, as if pulled, move toward each other, the nightmare becoming clearer the closer they get. Some die on the way, some live to face they terrifying fate their pilgrimage is building to. 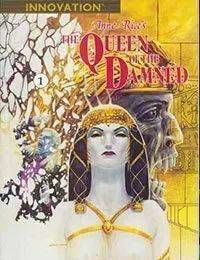 Lestats journey to a cavern deep beneath a Greek Island on his quest for the origins of the vampire race awakened Akasha, Queen of the Damed and mother of all vampires, from her 6,000 year sleep. Awake and angry, Akasha plans to save mankind from itself by elevating herself and her chosen son/lover to the level of the gods. As these three threads wind seamlessly together, the origins and culture of vampires are revealed, as is the length and breadth of their effect on the mortal world. The threads are brought together in the twentieth century when the fate of the living and the living dead is rewritten.<br />Innovation Comics adapted many of The Vampire Chronicles this being the third series adapted and The Vampire Lestat as the series before.<br />This series was originally intended to run for twelve issues but the final issue was cancelled and never published.